Discovery and new opportunities are the distinctive features in the 2018 Sud de France Top 100 awards, as 67% of the winning wines are new to the UK and 11% are entirely new products. Notably, too, organic or biodynamic certification increases to 15%. In its sixth year, the awards initiative by Sud de France Développement and the Conseil Interprofessionnel des Vins du Languedoc (CIVL) give the definitive snapshot of the diversity, quality and exceptionally good value of this wine region which is the largest in the world. Now also encompassing wines from the expanded region of Occitanie ( which includes the Languedoc and the Roussillon vineyards as well as part of the Rhône Valley and the South – West ), this has increased the scope of entries. Within the Top 100 wines, judging chairman Tim Atkin MW and the panel of 17 top writers and principal buyers from every sector of the trade, selected the best red, white and rosé, plus a personal favourite coup de cœur wine – one which has inspired them as outstanding and memorable. 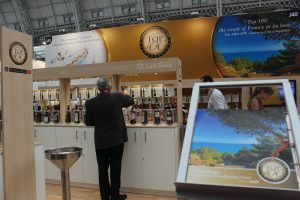 The Top 100 winners will be displayed for tasting at the London Wine Fair 2 1 to 2 3 May at Olympia London on the dedicated Top 100 stand (J4 0) . Many will be personally presented by their producers during the show. The awards this year comprised 634 wines from 209 producers. Winners were selected via rigorous blind tasting [ 5 April, London], and details, trends and comments from the judges on their favourites will be revealed online from 21 May. The Top 100 has helped producers of all sizes to showcase their wines to an increasingly wider sector of the trade, for awareness, education, appreciation, access and distribution. New trade judges this year included buyers from pub groups JW Lees and Fuller’s, and wine merchant & bars group Davy’s, who added a critical eye for a wide mass of consumers in their sizeable estate of outlets. The UK continues to stand strong within the top five markets in the world for AOC and IGP wines from Occitanie. Buoyant tourism to South – West France as an accessible and popular destination for British travellers has also helped establish discovery and loyalty towards wines of the region. “Each year, the Top 100 competition welcomes an ever more diverse selection of entries. This positively reflect s the confidence of the producers and their will to flourish in the British market. Exceptional value and attentive quality in winemaking set the solid standard of these winning wines. Notably, in 2018 we see an increase in entries and winners from the South – West – around 9% of the total, compared to 2 to 3% in the past. We would like to thank the producers, our judges, UK distributors, trade and wine writers, for helping us build the momentum of the competition every year and to make it truly come alive throughout 2018.